Adam Thomson, Cory Jane and Israel Dagg tries helped the All Blacks into a 19-0 lead before France managed a Dimitri Yachvili penalty just before the break. 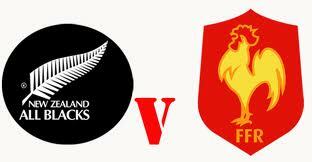 Dagg added his second try before Maxime Mermoz claimed an interception score. Dan Carter then added a drop-goal and although Francois Trinh-Duc claimed a converted France try, Sonny Bill Williams added a fifth for New Zealand. The only consolation for the French is that they now look destined to finish second in the group, which would take them into what is considered to be the easier side of the draw. France have earned their reputation as New Zealand's bogey team after stunning the All Blacks in the knockout stages of the 1999 and 2007 World Cups.